A previously unpublished autograph letter by Oscar Wilde appeared at auction last week in North Carolina. The item is a note sent by Wilde to Anne Lynch Botta, the 19th century doyenne of New York literary society, in which he expresses regret at not being able to attend a reception owing to his impending departure for Canada. Aided by the letter’s evident authenticity and the fact that the consignor is a direct family descendant, it sold at auction for $5,500. Anne Lynch Botta was the former Anne Charlotte Lynch, a first generation immigrant daughter of Dublin-born parents. 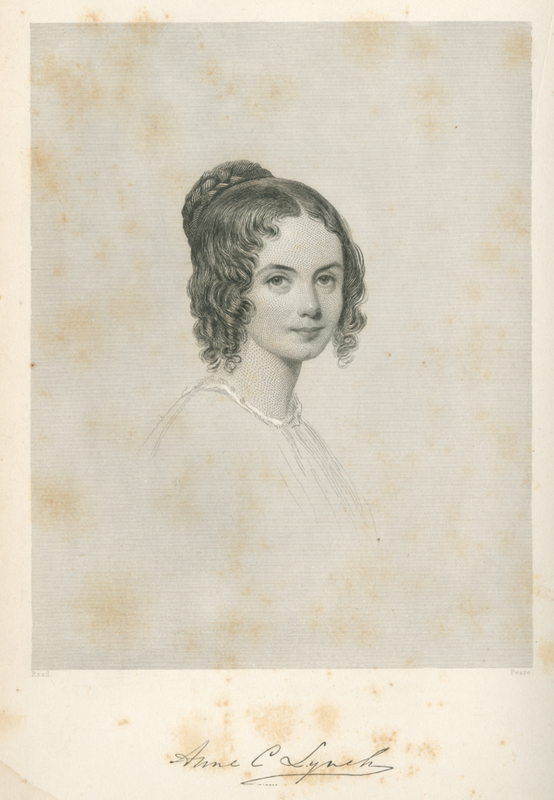 She was a poet, educator, and hostess who helped launch many literary careers in New York from her brownstone salon at 25 West 37th Street. Those who have read Eleanor Fitzsimons’ recent book Wilde’s Women will recall Anne L. Botta as one of the ladies mentioned. For those who have not had that pleasure, Eleanor features Mrs Botta in a recent posting on her blog here. Dear Mrs. Botta, I regret so much that I am unable to accept your most kind invitation for Wednesday but, I go to Canada tomorrow. I rarely can stay in any city long, but am become a sort of civilized vagrant, an artistic tramp, wandering over the wide unfinished world, my only reward being that I have learned the minor virtues, such as punctuality and getting up early; but they after all are unattractive. When I return however I hope to have the pleasure of seeing you and Professor Botta again. Believe me most truly yours Oscar Wilde. The text raises a few points of interest. May 11: Lecture at Wallack’s Theatre, New York City (afternoon). May 13-14: Train to Canada. May 15: Lecture in Queen’s Hall, Montreal, Quebec, Canada. The first indication is that arrangements for the lecture did not fit the normal pattern: it was not announced in the press beforehand, nor was it held in a music hall as was the case with most lectures. Consider also, that the previous day’s talk at Wallack’s in New York had been advertised as his “Farewell Lecture”, an event, moreover, which was reported in Brooklyn Daily Eagle the next day without any mention of a Brooklyn lecture that evening. Seen in 1910, the hotel from where Wilde wrote the note, and the theatre in which he lectured the same day. The hotel is extant at Broadway and 31st Street. 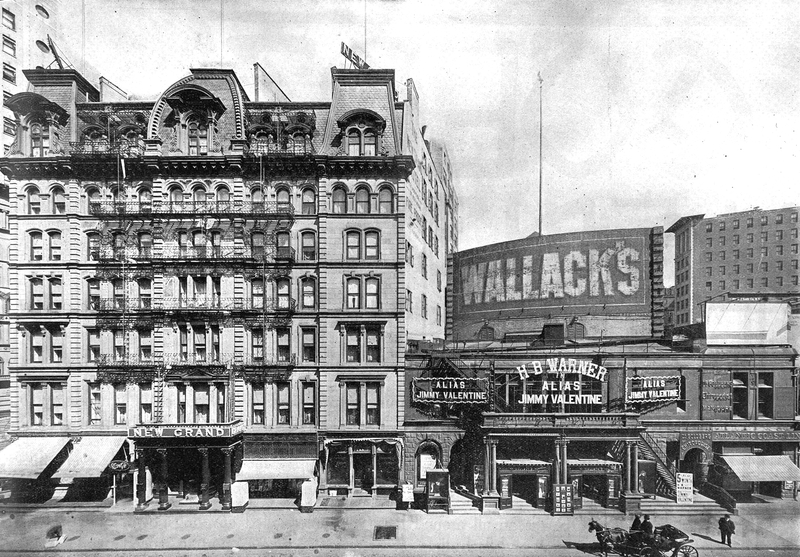 On Thursday, May 11, Wilde gave his much anticipated lecture at Wallack’s Theatre in New York City (P.T. Barnum occupied a front row seat). But we know from the nota Botta that Oscar thought he would be leaving for Canada the next day, so we can assume he did not know about the Brooklyn lecture when he wrote to Mrs Botta that morning. This not only reinforces the idea that the Brooklyn lecture was arranged late, but it also attests to what a condensed few days these were for Oscar. 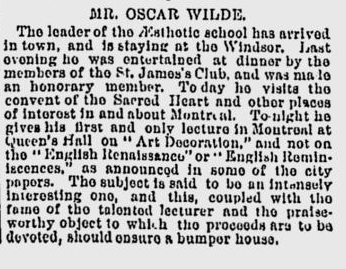 What I believe happened was that the afternoon lecture in New York was such a success (it was sold out and Wilde much fêted) that an additional Brooklyn opportunity suggested itself, or was suggested, allowing him to deliver the second lecture he had developed  for repeat or return visits to various cities. I brought Oscar Wilde to see your Mama [Julia Ward Howe] today, and we had a nice chat. He was to have dined with us tomorrow but unluckily got sailing orders from Montreal, where he has to lecture on Monday, and there is no train thither on Sunday. So after visiting with Julia Ward Howe in the afternoon, lecturing over in Brooklyn in the evening, Wilde returned to New York and it was on May 13 that he boarded the train at the Grand Central Depot (as it was then known) for the 26-hour journey to Montreal. He arrived later the next day, before dining as a guest of the famous St. James’s Club. And thus it began again. More socializing and his first Canada lecture on Monday, May 15. This notion chimes with how Wilde described himself more than three years later when writing to Harry Marillier from Glasgow. He described his life: “Lecturing and wandering—a vagabond with a mission.” (Complete Letters, 272). These two similar allusions are appealing because one often comes across a single idea presented by Wilde which, given his nature, one suspects may be capricious. But to see consistency in the search for Oscar’s character, the concept of a refined vagrancy might help us recognize, perhaps, that he thought of himself in a wider sense as an educated itinerant. The Marillier letter, incidentally, is hot stuff according to McKenna who identified it as one of Oscar’s most important for its sexual flirtations. This is understandable containing, as it does, talk about perfumes, perfect poisons and love of the impossible. But for the more prosaic minded, the Marillier billet-doux is more relevant for providing the subtitle of two modern books about Wilde. First, it is where we find Wilde’s phrase about the artistic life being a “long and lovely suicide” which was the subtitle of Melissa Knox’s 1994 psychoanalytic (and syphilitic) biography. And second, as we have already seen, it is where Wilde coined the phrase “A Vagabond With a Mission” which is the line appended by Geoff Dibb to his estimable chronicle of the UK and Ireland lecture tours. Previous chronologies mistakenly recorded the venue of the May 12 lecture as Williamsburg, VA, which is 400 miles away from New York and two days round-trip by train. The correct Williamsburg is a district of Brooklyn, NY. Also, a letter from Wilde to Norman Forbes Robertson cannot have been written from Montreal on May 12 as noted in Complete Letters, 168. Compare Wilde’s impromptu talk on St. Patrick’s Day. See Lecture Titles for the genealogy of Wilde’s lectures. Maybe he just wanted an excuse not to go. Anyway the next Wednesday he would be long gone. Many thanks John for the mention of Wilde’s Women and for linking to my blog. Much appreciated! Hi jaedimurphy, Wilde’s letter indicates that they had met on an earlier occasion (I put it as being very early in his tour, before he left New York for the first time) since he writes ‘I hope to have the pleasure of seeing you and Professor Botta again’. After looking further into Anne Botta, I have become a fan. Particularly one of her missions to provide a inspirational haven for artists of NYC. Thanks for sharing John. Mr and Mrs Botta were at the Bigelow dinner for Wilde at 21 Gramercy Park on January 8. Thank you John – have a great Christmas & New Year.